Build 19 provides a car security mode, better support for the Telit GC864, and an improved remote sensing mode for monitoring various equipment. Car security board has ATMEGA88, GC864 GSM module, Aarlogic GPS 3A, integrated antenna, lithium ion battery charger, optoisolated alarm inputs, and relays to control car functions. 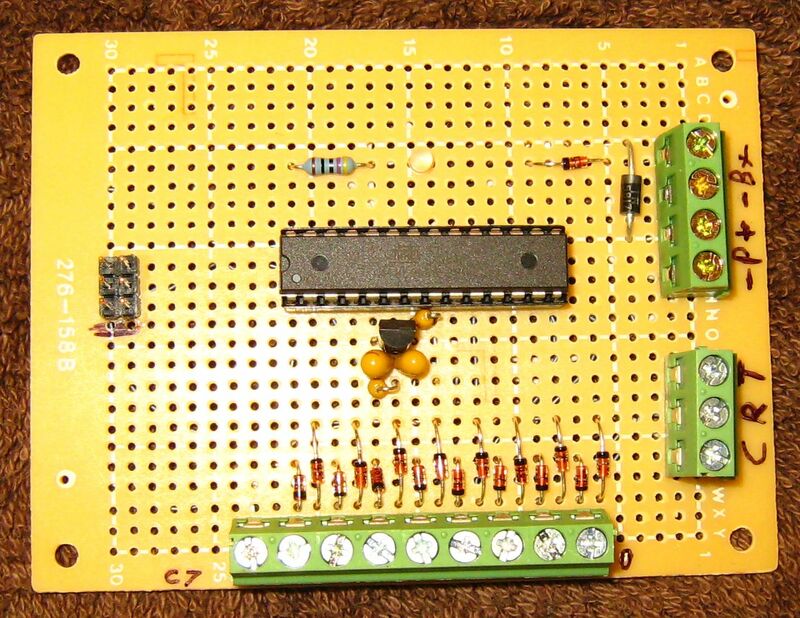 Generator monitor board has ATMEGA88 and voltage regulator. Port B is brought out to screw terminals, and is ESD protected by reverse biased diodes to ground and Vcc. Generator monitor installed at a public safety repeater site. These modes require an ATMEGA88. B4 - INPUT - Power Lost input, internal pull-up enabled, use NPN transistor biased by external power. When external power is lost, transistor turns off. Alert is sent when line goes HIGH. B0 - OUTPUT - Starter Disable output. Goes HIGH when CARDISABLE command received, LOW when CARENABLE received. Use resistor, NPN transistor, and relay to open starter circuit. B1 - OUTPUT - Horn/Lights output. Pulses when HONK command is received. Use resistor, NPN transistor, and relays to drive horn and running lights circuits. B5 - OUTPUT - Unlock output. Pulses high for one second when CARUNLOCK command is received. 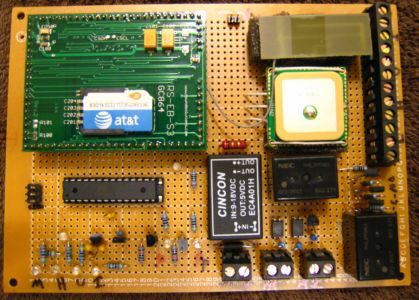 Use resistor, NPN transistor, and relay to operate door lock solenoid. C0 - OUTPUT - Master enable output. Goes HIGH when any relay is energized. 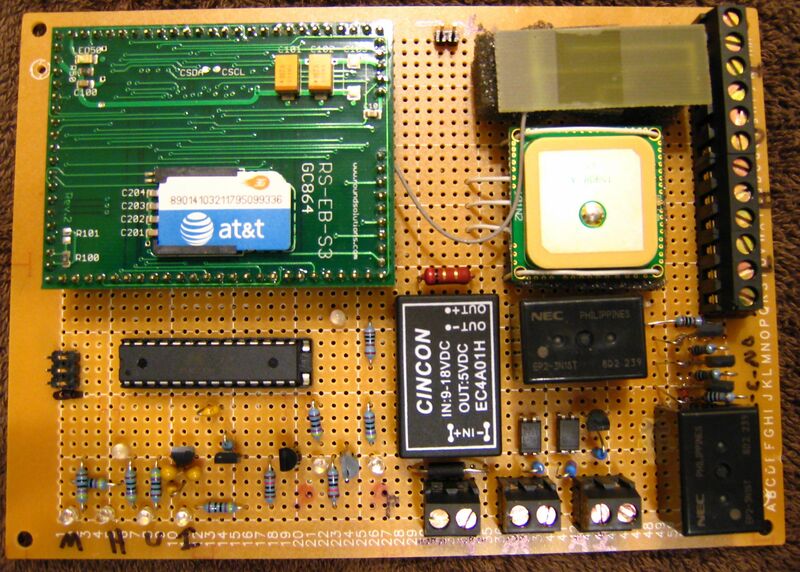 This can be externally ANDed via transistors to enable the relay circuits. Provides protection against false triggering of the relays. All relays must be protected by reverse diodes across the coils to prevent induced voltage damage. The CARDISABLE output is designed to disable the starter. I specifically do not support or recommend disabling the ignition or fuel pump circuits. Any such use creates hazards for which I am not liable. All car circuits must be properly insulated, and the power input from the car should be fused. Use optocouplers on the ALARM inputs. Use relays rated for more than the fuse rating of the car circuit you are wiring into. Do not modify car wiring without the car service manual. Identify and avoid airbag wires! Disconnect the car battery before doing any work. This is a generator monitoring example. There are up to eight inputs and the text labels can be customized. The + indicates a condition which is asserted (input pulled down or LOW) and the - indicates one which is not asserted (input HIGH). 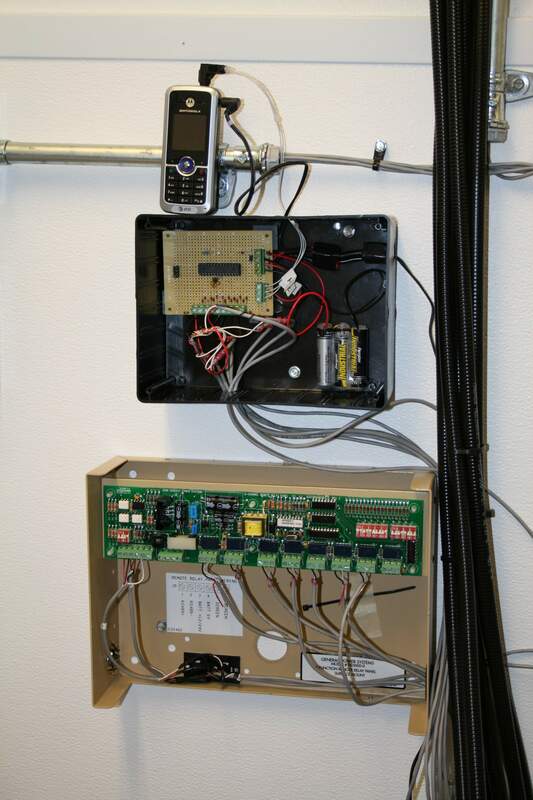 This feature was added for a customer who wanted to monitor a generator, but can be used for a variety of purposes. Use the OPTION_REMOTE_IO and OPTION_REMOTE_IO_TEXT settings for this mode. The text is hard coded under PHONE_STRING_INPUT_TEXT. The GC864 module has RESET, ON/OFF, and PWRMON lines. Build 19 will turn the module on if it is off, reset it if it hangs, and cycle its power in POWERSAVE mode. This requires three I/O lines and two transistors with base resistors. Use the OPTION_GC864_POWER_AND_RESET. The transistor emitters are grounded and collectors go to the GC864 RESET and ON/OFF lines.